The Web Connector's Optional Services screen can be customized to display other services you may wish to up sell. To customize, edit the service and go to the Connect tab. The Web Connector settings are on the right-hand side of the page. 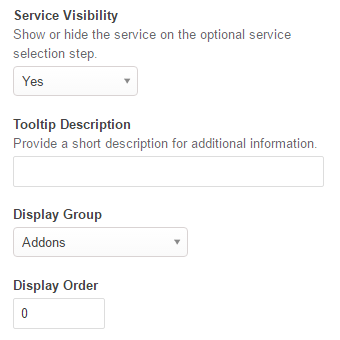 Service Visibility allows you to specify if you want the service you are currently editing to be available as an optional add-on later on within the connector. Tooltip Description allows you to provide a short description of the service. Display Group allows you to add it to a group of services - this is useful if you have many different services. You cannot currently create custom group titles or change the order in which they appear. Display Order lets you choose what order you want your services to appear in - simply order them with 1 meaning shown first etc. If you haven't already, check out our guides for Embedding web connector into your website and sending Web Connectors forms to prospects and clients.